HTRI's Research & Technology Center (RTC) is a 22,500 ft2 multimillion-dollar research facility in Navasota, TX, USA. It includes eleven operating research units as well as support facilities and equipment. The RTC enhances our research capabilities by providing a controlled environment for testing. To learn more about our heat transfer testing services, contact us at contracts@htri.net. The ACU is an industrial-scale air cooler designed according to practical API 661 guidelines, with reconfigurable mechanical components. Incorporating two fan cells, this test unit also features a fixed tube bundle layout with the option of forced-draft or induced-draft plenums. To record airside measurements, a traverse system holds various anemometers and thermocouples, as well as static and total pressure sensors. Psychrometric and wind measurements are also recorded. Using two parallel test sections for a single fluid, the HTFU-1 provides thermal fouling and pressure drop data for hydrocarbon fluids (e.g., gas oils or crude oils) in any flow regime for any metallurgy. Note: The maximum wall temperature is dependent on the operating conditions in use. Similar to the HTFU-1, the HTFU-2 provides thermal fouling and pressure drop data for hydrocarbon fluids (e.g., gas oils or crude oils) in any flow regime for any metallurgy. The unit also has the capability to perform tests on up to four different test sections. The RFU provides screening results for crude oil fouling studies. It operates on minimal volume (3.8 L/1.0 gal) and has a heated probe with a spinning cup around the probe to induce flow. The unit has lower shear stress, resulting in shorter run times and faster fouling rates. These features make it ideal as a preliminary research tool. The LLHE is primarily used to evaluate cooling equipment. This unit is the largest capacity rig in operation at HTRI in terms of flow rates and duty, and consists of cold and hot water sub-loops. The LPCU collects heat transfer and pressure drop data of condensing and single-phase flows over a wide range of vacuum conditions. Hydrocarbons and refrigerants are used as test fluids. The unit features a low temperature chiller and can be configured for tubeside or shellside testing. The MBU measures heat transfer for different flow boiling regimes and boiling mechanisms, as well as pressure drop for various two-phase flow patterns. The unit can examine different geometries, including compact heat exchangers and enhanced tubes using pure fluids or hydrocarbon mixtures. The MCU tests pure components and hydrocarbon mixtures (with and without non-condensables) to measure condensation heat transfer and pressure drop performance of shell-and-tube and compact heat exchangers. Tests can cover a wide range of operating conditions, including vacuum and high pressure. The MVU allows qualitative and quantitative flow visualization of two-phase air/water flows in process heat exchanger equipment. 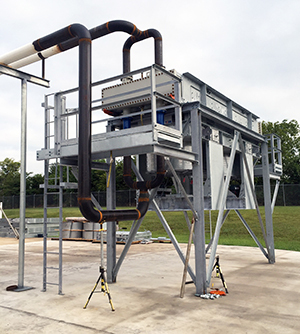 The unit's test section is a transparent shell-and-tube exchanger (TSTX) that can be easily reconfigured with different bundle layouts and baffle types, cuts, and spacings. The Pipe Flow and Serpentine Loops on the MVU enable the study of two-phase flow regimes in large diameter pipes. Both loops were constructed using transparent piping, allowing for flow visualization. The pipe flow loop facilitates research on upflow, horizontal flow, and downflow; the serpentine loop facilitates fired heater research. The PTU is used to develop and validate thermal design methods for industrial-sized reboilers, condensers, or general purpose exchangers. The unit features a vertical separation tank with up to four prototype exchangers. Bundles or cores can be tested in boiling, condensing, single-phase vapor, or single-phase liquid service, with a variety of hydrocarbon-based fluids from viscous laminar up to turbulent service. The vertical separation tank facilitates testing of thermosiphon reboilers. 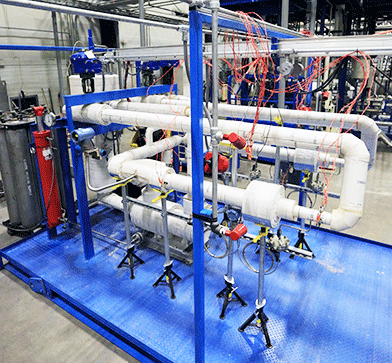 The TSPU features two single-tube test sections: one where the tubeside fluid is heated and one where it is cooled. A progressive cavity pump is used to circulate the fluid, which can include high viscosity liquids, non-Newtonian fluids, and slurries. It is ideal for testing tube inserts. These research units can be customized to meet the changing needs of our customers. We are also available to conduct research and to construct new rigs under contract. The facility′s physical plant includes a 500-hp Johnson Boiler with a heating capacity of 4980 kW (17 million Btu/hr) and a two-cell Marley cooling tower with a stainless steel basin and a cooling capacity of 6150 kW (21 million Btu/hr), two cooling tower pumps, two 50-hp (200 cfm) air compressors, a 500 cfm air dryer, and condensate return vessel and pumps. The machine shop includes a milling machine, lathe, drill press, band saw, pipe threader, and welding equipment. Instrumentation testing is performed on site using various calibration devices. An onsite laboratory allows our technicians to perform various tests to ensure compliance with environmental regulations and to analyze fluids from the research units.